Please join us in celebrating the Community Care Network, developed as a collaborative effort by Wooster Community Hospital and The College of Wooster. 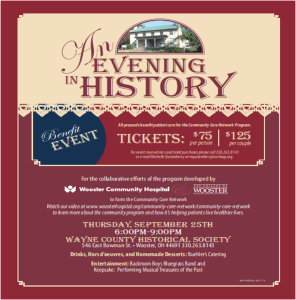 The event is Thursday, September 25 from 6:00pm – 9:00pm on the grounds of the Wayne County Historical Society. Select areas of the campus will be open for tours, staffed by Wayne County Historical Society docents. Drinks, hors d’oeuvre, and homemade desserts provided by Buehler’s Catering. Entertainment includes the Backroom Boys Bluegrass Band and Keepsake; performing Musical Treasures of the Past. Tickets are $75 per person or $125 per couple. 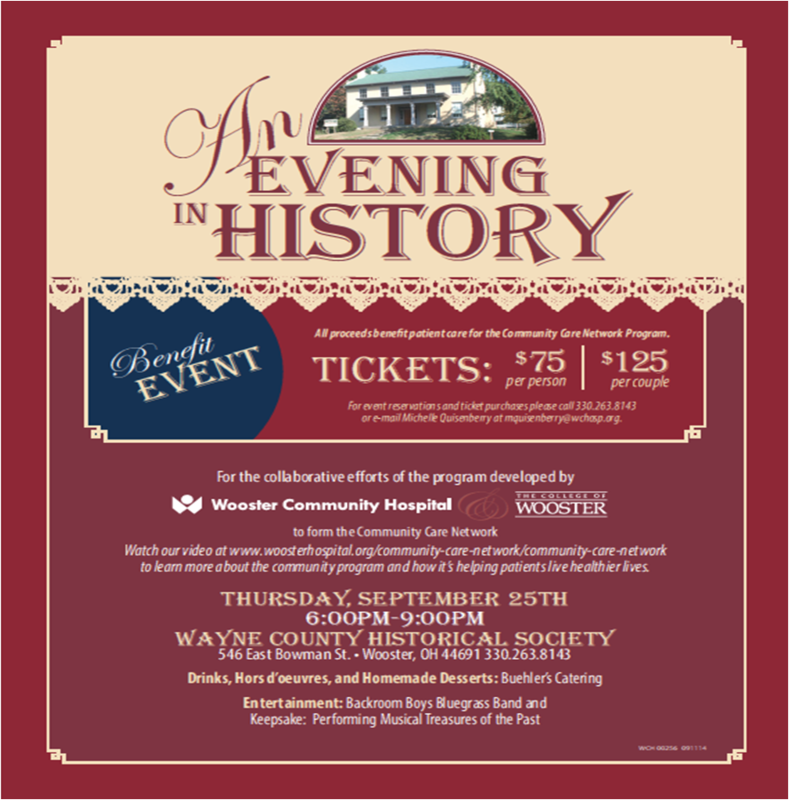 For event reservations and tickets purchases, please call (330) 263-8143 or e-mail Michelle Quisenberry at mquisenberry@wchosp.org. This is a not to be missed event! What about the Backroom Boys Bluegrass Band? I don’t see us on the bill. We’re scheduled to play from 6-8 PM. Joe, please see the updated flyer for this post. This one includes the Backroom Boys Bluegrass Band. Thank you for bringing this to our attention.